This oddly-shaped galactic spectacle is bursting with brand new stars. The pink fireworks in this image taken with the NASA/ESA Hubble Space Telescope are regions of intense star formation, triggered by a cosmic-scale collision. The huge galaxy in this image, NGC 4490, has a smaller galaxy in its gravitational grip and is feeling the strain. Compared to the other fundamental forces in the Universe, gravity is fairly weak. Despite this, gravity has an influence over huge distances and is the driving force behind the motions of the most massive objects in the cosmos. 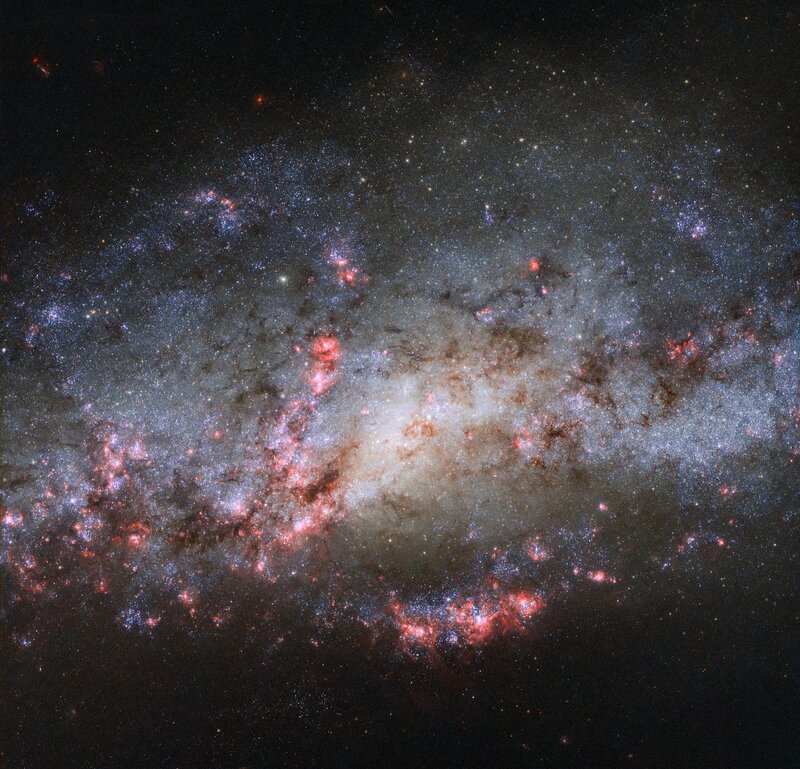 The scattered and warped appearance of the galaxy in this image, NGC 4490, is a prime example of the results of gravity’s unrelenting tug. Over millions of years, the mutual gravitational attraction between NGC 4490 and its smaller neighbour, NGC 4485, has dragged the two galaxies closer. Eventually, they collided in a swirling crush of stars, gas, and dust. In this image, this most intense period is already over and the two galaxies have moved through each other, untangled themselves, and are speeding apart again. But gravity’s pull is relentless; the galaxies are likely to collide again within a few billion years. Together NGC 4490 and NGC 4485 form the system Arp 269, which is featured in the Atlas of Peculiar Galaxies. They are located 24 million light-years from Earth in the constellation of Canes Venatici (The Hunting Dogs). The extreme tidal forces of their interaction have determined the shapes and properties of the two galaxies. Once a barred spiral galaxy, similar to the Milky Way, NGC 4490’s outlying regions have been stretched out, resulting in its nickname of the Cocoon Galaxy. Virtually no trace of its past spiral structure can be seen from our perspective, although its companion galaxy NGC 4485 — not pictured here — still clings on to its spiral arms. This cosmic collision has created rippling patches of higher density gas and dust within both galaxies. The conditions there are ripe for star formation; the brilliant pink pockets of light seen here are dense clouds of ionised hydrogen, glowing as they are irradiated with ultraviolet light from nearby young, hot stars. This spectacular burst of new activity has led to NGC 4490’s classification as a starburst galaxy. Star formation is also evident in the thin thread that connects the two galaxies: a bridge of stars created by the ancient crash, stretching over the 24 000 light-years that currently separate the fated pair. But where there is life, there is also death. Several supernovae have also been spotted in NGC 4490 over the past few decades, including SN 1982F and SN 2008ax.